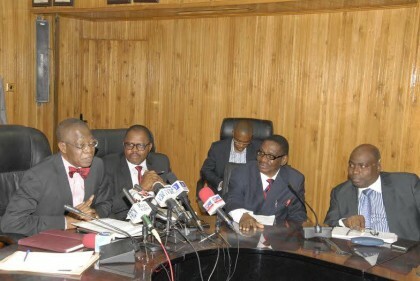 The Minister of Information and Culture, Alhaji Lai Mohammed, has hailed the role being played by the Presidential Advisory Committee Against Corruption, led by renowned Professor of Law and civil rights Activist Itse Sagay, in the country’s anti-corruption battle. Alhaji Mohammed said the visit by members of the Committee could not have come at a better time, ”considering that we are presently running a National Sensitization Campaign Against Corruption”. He acknowledged the huge support that the ministry had received – and has continued to receive – from the committee since the launch of the campaign, saying it had gone a long way in contributing to the modest achievement we have made since the launch. He said a recent poll by the Governance Accountability Initiative for Nigeria (GAIN) has shown that the support among Nigerians for the anti-corruption war is very high, with 76% of respondents expressing support for the initiative, while also showing that in terms of areas of concern among Nigerians, the anti-corruption fight is next only to insecurity. ”These results tally with what we have found out in our various engagements since we launched the National Sensitization Campaign,” Alhaji Mohammed said, while commending the media for the major role they have played in disseminating necessary information about the campaign to the people, and also for providing feedback to the government. He said while some of those who have picked issues with the strategy adopted by the government to sensitize Nigerians may have done so genuinely, perhaps because they have not taken the time to understand the strategy, others are only criticising the anti-graft campaign just to shoot it down. ”A key strategy we have adopted in our campaign is to strip corruption of its previous abstract status by putting a face to it. In other words, we are emphasizing and highlighting the cost of corruption to the lives of Nigerians. ”When we revealed that 55 people allegedly stole a total of 1.34 trillion Naira between 2006 and 2013 – a figure that has been independently confirmed by a Civil Society Organization, Media Rights Agenda (even though with an extended timeline), our intention was not to villify anyone but to show to Nigerians how funds that could have been used to provide infrastructure and upgrade educational and health facilities, for example, have been looted,” the Minister explained. Earlier, Prof. Sagay said the visit was to give the Committee the opportunity to dialogue with the Minister, whom he described as proactive, courageous, intelligent and knowledgeable, and his team, especially because the parastatals under the Ministry of Information and Culture have a vital role to play in the fight against corruption. ”Parastatals like the NTA, FRCN, NOA and VON are critical in educating the public and increasing the level of consciousness (about the evils of corruption),” he said. The Committee head urged Nigerians to buy into the anti-corruption struggle, saying by doing so, they are laying the groundwork for their children to live in an atmosphere of stability and to have the opportunity to achieve their God-given potentials.